Home Lifestyle Mercedes-AMG Project One leaked. Is this it? Mercedes-Benz must be doing this on purpose or the secrecy department is running wild, as the company can’t keep any of its future models behind closed doors before they hit the internet in official photo galleries. The latest leak seems to depict the Mercedes-AMG Project One, the coolest car ever built by the brand’s power house. 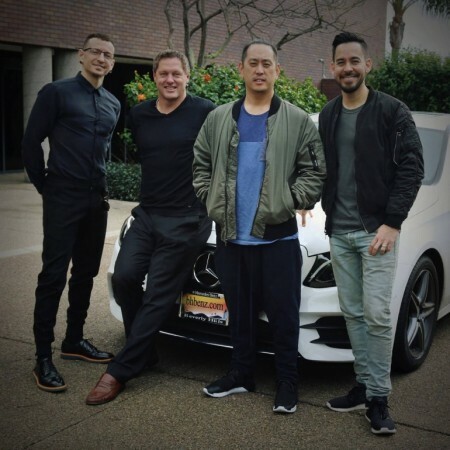 The photo in question, published by the Inautonews website, shows the members of the rock band Linkin Park making a circle around a table on which there stands a clay mould. It all took place in the Mercedes-Benz Advanced Design Studio in Carlsbad, California, as the musicians accidentally bumped into what seems to take the shape of the AMG Formula 1-inspired over 1000-horsepower hypercar. The three seem to be acting like designers. The real Design chief Gorden Wagener is nearby. Still far from the looks of a future prototype the R50 name coded car is set to make its debut at the Frankfurt Motor Show and it will take all its power that will probably fall in the 1.300 – 1.500 HP range onto the road, being the lightest car out there: the kerbweight of the 1.6-liter engine powered hypercar will be around only 700 kilograms. Find out all there is to know about the Mercedes-AMG Project One right here: Mercedes-AMG Project One is the name of the anniversary hypercar.